Witness Jesus "Rey" Zambada Garcia spun story after tangled story of turf wars between rival gangs and factions, jealousies and insults that all seemed to end in violence. 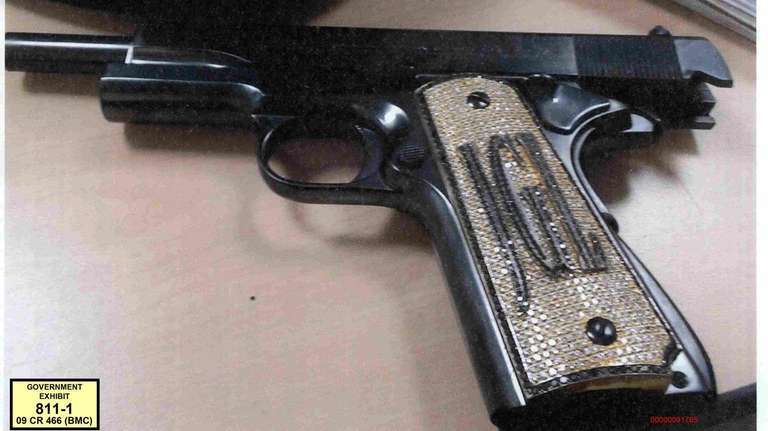 A government exhibit at the Brooklyn federal court trial of alleged Mexican drug kingpin Joaquin "el Chapo" Guzman Loera shows a handgun with a diamond encrusted grip containing his initials "JGL." Monday was murder day at the Brooklyn federal court trial of alleged Mexican cocaine kingpin Joaquin “El Chapo” Guzman Loera, as the first of an expected 16 government informants finished his direct testimony by outlining the accused drug lord’s participation in more than a half-dozen assassinations. Over six hours of testimony, witness Jesus “Rey” Zambada Garcia, the brother of Ismail “Mayo” Zambada Garcia, one of Guzman’s co-leaders of the Sinaloa cartel, spun story after tangled story of turf wars between rival gangs and factions, jealousies and insults that all seemed to end in violence. One victim was Rodolfo Carrillo-Fuentes, whose family was part of the Sinaloa cartel but also worked with a rival gang, the Zetas, as tensions grew on the way to all-out war over control of Juarez. Carrillo-Fuentes, Zambada said, went to a 2004 sitdown with Guzman over a killer the Zetas wanted turned over. “When it was over, Chapo extended his hand and said, ‘See you later friend,’ ” Zambada testified. “He just left him there with his hand extended. My compa [compadre] Chapo got really upset. … He couldn’t take Rodolfo any more.” Rodolfo was killed coming out of a movie with his wife, who died, and kids, who didn’t. Then, there was a man named Julio Beltran, identified by Zambada as a Sinaloa cartel member and drug dealer who got a reputation for not taking orders — arranging for a drug shipment to Acapulco that he was warned against, and carrying out an unauthorized hit that he lied about. His brother and Guzman ordered Beltran killed, and Zambada later talked to a member of the squad that carried out the killing and described a “hail of bullets” from an AK-47. “He said there was this burst of bullets and that they cut off his head, his head was hanging off from one side,” Zambada testified. Guzman, 58, was extradited from Mexico last year after twice escaping prisons. He is charged with using violence, intimidation, murder and bribery to run a trafficking operations responsible for smuggling $14 billion of cocaine as well as heroin, marijuana and methamphetamines into the United States over 25 years. On one trip in 2005, he said, he flew up with a family contingent on two planes for relaxation, drinking, and recreation. For fun, he said, the group began target shooting with AK-47s and AR-15 assault rifles. 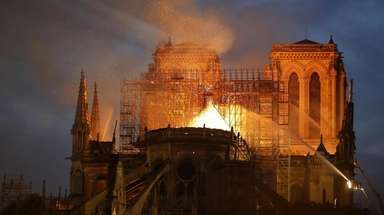 “They did test out a bazooka,” Zambada added, almost as an afterthought. “Who?” asked a prosecutor. “Chapo,” he answered. Zambada said that in just one of the drug wars he was part of – an internal struggle involving a faction called the Beltran-Leyvas – “hundreds” were killed, including a police commander named “Rafita,” targeted because he was also the “most dangerous” sicario – or gunman – of Guzman’s rivals. Rafita was well-protected by bodyguards, Zambada testified, so Sinaloa killers followed him till they figured out where he lived. Then, one man slammed on his car brakes to create a squeal right after Rafita’s son left for school, and another banged on the door yelling that the boy had been hurt. “Rafita ran out to look for the boy, and that’s where they killed him,” Zambada testified. The defense theory of the case is that Guzman is a fall guy for Zambada’s brother, who remains at large. On cross-examination, which began late Monday, defense lawyer William Purpura targeted Zambada’s near total recall of deals, adventures and verbatim conversations from two decades ago. He also wondered aloud about the number of witnesses who might confirm his stories — from helicopter pilots to Sinaloa leaders — who couldn’t, because they were dead. “No one but you?” Purpura asked. “Fortunately, I’m alive,” Zambada answered.